Take sooji in a bowl. Add chopped onions, green chillies, coriander and curry leaves. 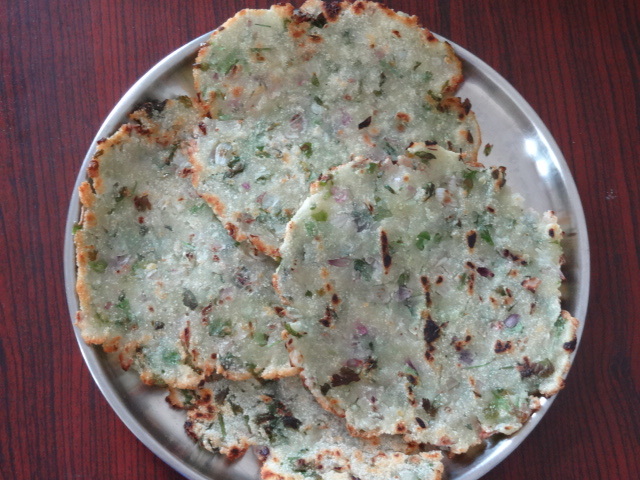 Add salt and sufficient water to form dough similar to the one made for chapathi. Keep aside for 5-8 mins. Take a thick polythene sheet, apply little oil over it. Meanwhile keep pan over medium flame till you prepare roti. Pinch desired amount of the dough and place it on the sheet. Now press it using rolling pin or your finger tips or both. By now, the pan would be hot. Place roti over the pan and apply oil or butter if required. Serve immediately with any chutney or just with ghee. This is something I would love to try. Looks like Akki Rotti!